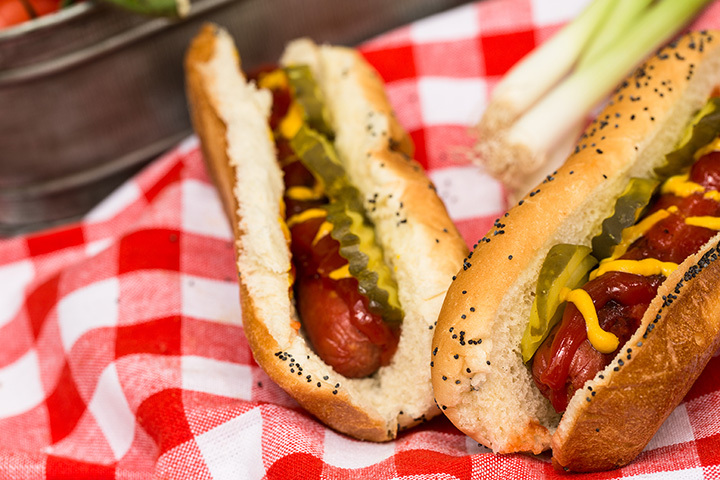 The hot dog, an American staple at picnics, baseball games and backyard barbeques has come a long way from its humble beginnings. The popularity of this iconic finger food has elevated it into the realm of a gourmet meal in which you’ll find ketchup and mustard replaced with everything from pico de gallo to ancho chile dusted onion strings. The hot dog isn’t just for ballparks anymore, and New Mexico has achieved a gourmet level with its dogs. Here are the 10 best in the state. Yes, burgers and wings are on the menu here, but just as tasty are the 100 percent all beef Nathan’s hot dogs. There are six to choose from, each representative of the flavors of the state for which they are named. The New Mexico, of course, comes with red or green chile and cheese. Highlights of the four corners area include the Utah, Colorado and Arizona dog, all smothered with differing degrees of grilled onions, red and green peppers, pico de gallo and American cheese. Texas and Cali dogs on the menu spotlight jalapenos and bacon and chile con carne and fritos, respectively. All dogs are served on a fresh hoagie bun and come with plate full of fresh cut homemade French fries. Open Monday through Saturday. A stop at this quaint, reconditioned building, originally used to process apples and vegetables in the 1940s, is like taking a step back in time. The signature Barn Dog, however, is all 21st century. This spicy elk meat sausage, filled with jalapenos and cheese, is smothered in German mustard and topped with pickled sauerkraut. Pair it with the cool and refreshing house creme root beer float or the house made cherry cider for a savory and sweet repast. Also on the menu is a traditional chile dog and a New Mexico green chile cheese dog. Fresh pie, gourmet fudge, a vintage soda fountain and an old-style emporium add to the nostalgia here. Open daily, year-round. A family tradition since 1956, this family-owned retro-style drive-in is a local insti-tution. The town was home to the Norman Petty Recording Studio which made it a player during the 1950s and 60s rock-and-roll scenes and the drive-in pays homage to this with golden oldies from the era rockin’ almost round-the-clock. The two hot dogs on the menu are straightforward and good. The chili dog, served on a round bun, is mild and delicious. Add jalapenos, green chile or green sauce to spice it up or bacon and cheese for additional flavor and texture. The deep-fried corn dog is sweet and crunchy. A side order of cheese sauce is great for dipping. Whether you dine-in, carry out or get curb service, this is a fun and nostalgic place to stop. Open 7 a.m. to 10 p.m. daily. Historic Mesilla Plaza is home to not one, but two Andele’s Restaurants. The latest extension to the popular original dining spot is the Dog House across the street. Its casual, cantina like vibe is the perfect spot to eat a dog and bring a dog … the four-legged kind. Top dog here is the Mexican hot dog which is quite a meal: bacon, pinto beans, grilled onions and condiments that include chopped fresh onions and tomatoes, jalapeno sauce, mayonnaise and mustard. If that’s not enough, try the chile cheese dog with green chile queso. If you’re still hungry there’s a complimentary self-service chips and five different salsa bar. Open daily. This little shack with its blue awning brings a taste of the windy city to the South-west. The namesake dog begins with a Vienna all beef hot dog that’s smothered with classic toppings of yellow mustard, relish, onions, cucumber, pickle, tomato, sport peppers and a dash of celery salt, all served on the traditional poppy seed bun. Sitting in the fresh air of the outdoor tables, there’s no indoor seating, Chi-town seems like just a bite away. Additional menu items capture other regional tastes: There’s a Coney Island Dog and of course, a Santa Fe Dog with your choice of red or green chile. If beef is not your thing, substitute any order with a turkey dog. Open Monday through Saturday. Here, the mantra is about, “putting a new spin on an old favorite,” a dogged effort that has paid off with a loyal following. It would be hard to find a more eclectic se-lection of dogs. The menu is loaded, literally, with unique choices. At the top of the list is the Fully Loaded, an all-beef hot dog wrapped in thinly sliced potato, deep-fried, topped with house-made horseradish sour cream, cheddar cheese, chives and bacon. Other highlights include a Caprese dog, a re-creation of the salad, the Rising Sun, with an emphasis on the wasabi and ginger flavors of Japan, and the BB&C, a backyard barbecue favorite that’s bacon-wrapped and topped with house-made BBQ sauce. That’s just the beginning. You could eat here every night of the week for a month and not eat the same dog twice. Don’t miss the bite-sized dogs—panko crusted and deep fried. Open daily. The beautiful New Mexico night sky is lit up by the festive neon lights of this drive-thru retro-looking hot dog and ice cream eatery. During the day, this dog-friendly spot, for both the ones in a bun and the four-legged type, is just as festive. You’ll find a dozen different all Nathan’s 100 percent pure beef hot dog meals that meld perfectly with the wide-variety of frozen custard treats and old-fashioned sodas, malts and shakes. Plus, there’s a hot-diggity-dog two-for-one lunch special—buy one dog, get one free. Next time you’re hankering for a dog of a different sort, maybe with Fritos on top or jalapenos or green chile relish, this is the place to go. Drive-thru and walk-up window. Open daily. The Cube is not square, it’s downright groovy as evidenced by a colorful chalk-board hanging on the wall scrawled with a peace love and barbecue declaration. It bills itself as a barbecue place, but the gourmet hot dogs here are every bit as popular as the brisket. The cooked-to-order dogs are all 100 percent beef frank-furters with a natural casing that gives them just the right snap when you bite into them. The popular 505 dog, a shout out to the local area code, is wrapped in bacon, deep-fried and topped with green chile and avocado and is a hometown favorite. All the dogs have a signature ingredient from blue cheese on the Parisian to chipotle sauce on the Guadalajara to Texas-style chile on the double chile cheese dog. Add an order of green chile cheese fries to round out the experience. Open Tuesday through Sunday. At Classics, the term UFO takes on a whole new meaning: Unusual Frankfurter Option! In what some might consider a corny, alien town, this locally-owned and operated drive-thru offers diners a supernatural choice of 100 percent black Angus hot dogs, all served with an out-of-this-world side of baked beans, potato salad, coleslaw or chips. The constellation of hot dogs found here are indeed stars, from the UFO to Campfire to Pucker to Frito dog, and all points in between. Whether you drive thru, take out or sit outside at one of the picnic tables, there’s no mystery to what might happen to your meal … it’s so good, it’ll disappear before your eyes. There’s a lot of family-friendly fun to be found in Aztec, not the least of which is this eatery where you’ll find classic hot dog selections, up-beat music and the guarantee that you’ll always leave with a smile. The setting is all about capturing that friendly, small town vibe that brings locals and tourists in to sit a spell whether it’s in or outside under the bold and colorful umbrellas. The compact menu doesn’t disappoint and boasts an All-American, Chicago, New York, Chile and Jumbo Polish, 100 percent Vienna beef dog. Add a drink and some chips for a great combo deal. Open Monday through Saturday.